A research team led by HITS scientist Robert Grand ran 36 simulations of Milky Ways on German supercomputers, for the first time including the magnetic fields that permeate the gas and dust between the stars. Thousands of processors, terabytes of data, and months of computing time have helped a group of researchers in Germany create some of the largest and highest resolution simulations ever made of galaxies like our Milky Way. The work of the Auriga Project, led by Dr. Robert Grand of the Theoretical Astrophysics group at HITS (Heidelberg Institute for Theoretical Studies), now appears in the journal “Monthly Notices of the Royal Astronomical Society”. The results have been achieved in one subproject of the collaborative research center 881, “The Milky Way System”, of the German Research Foundation (DFG). Astronomers study our own and other galaxies with telescopes and simulations, in an effort to piece together their structure and history. Spiral galaxies like the Milky Way are thought to contain several hundred billion stars, as well as copious amounts of gas and dust. The spiral shape is commonplace, with a massive black hole at the center, surrounded by a bulge of old stars, and arms winding outwards where relatively young stars like the Sun are found. However, understanding how systems like our Galaxy came into being continues to remain a key question in the history of the cosmos. The enormous range of scales (for example, stars, the building blocks of galaxies, are each about one trillion times smaller in mass than the galaxy they make up), as well as the complex physics involved, presents a formidable challenge for any computer model. A group of international scientists from HITS (Germany), Durham University (UK), Max Planck Institute for Astronomy (Germany) and Massachusetts Institute of Technology (USA) have tackled this obstacle. 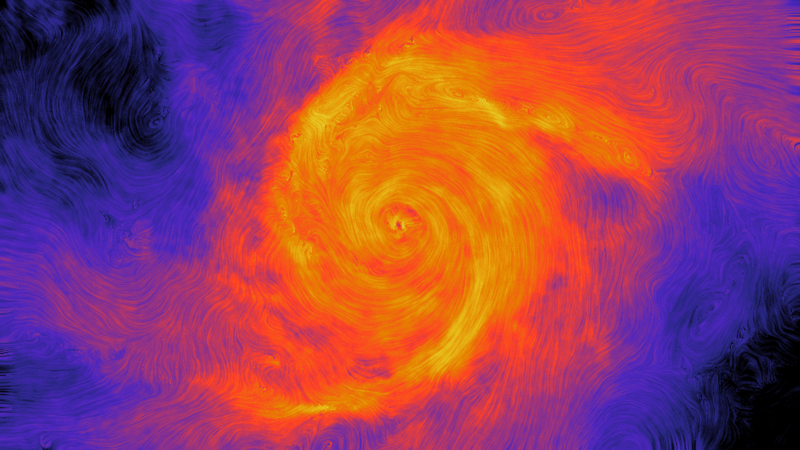 Using the Hornet/Hazel Hen (Stuttgart) and SuperMUC (Garching) supercomputers in Germany, the team ran simulations of 30 different Milky Ways at high resolution, of which 6 were ran at very high resolution for even more details. The simulations ran for several months and used approx. 18 million CPU hours in total. For their simulations the researchers used the “AREPO” code, developed by HITS researcher and group leader Prof. Volker Springel, which enables scientists to simulate a wide range of galaxy shapes and sizes with unique precision and includes one of the most comprehensive physics models to date. The code includes phenomena such as gravity, star formation, hydrodynamics of gas, supernova explosions, and for the first time the magnetic fields that permeate the interstellar medium, more precisely, the gas and dust between the stars. Black holes also grew in the simulation, feeding on the gas around them, and releasing energy into the wider galaxy. The team also sees that smaller galaxies can spiral into the Milky Way galaxy early in its history, in a process that could have created large spiral discs. The scientists will now combine the results of the Auriga Project work with data in surveys from observatories like the Gaia mission, to better understand how mergers and collisions shaped galaxies like our own. “The Auriga Project: The Properties and Formation Mechanisms of Disc Galaxies Across Cosmic Time,” Robert J. J. Grand et al., 2017 May, Monthly Notices of the Royal Astronomical Society, vol. 467, pp. 179-207 [https://academic.oup.com/mnras/article-lookup/doi/10.1093/mnras/stx071, preprint: https://arxiv.org/abs/1610.01159].